Coffs Harbour Garden Club: Friends or Foes? There are some visitors to our gardens that are Australian iconic birds. The question is - are they friends or foes? 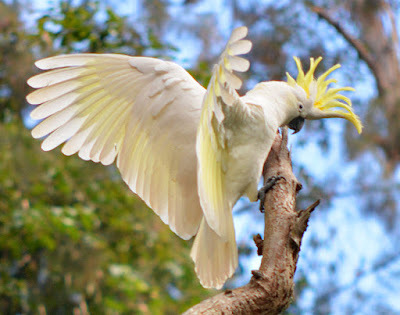 The raucous sulphur-crested cockatoo is a large parrot, usually around 50cm long with snowy-white plumage and a beautiful bright yellow crest. This bird is undoubtedly a tourist favourite but perhaps not so well-loved by locals because of its playful but very destructive habits, damaging plants, buildings (particularly decking, facia and panelling) and snacking on produce like macadamia nuts and citrus fruits. They can also be seen ripping bark back - sometimes for the joy of just doing it and other times to eat insect larvae found under the bark. Pine cones are a favourite in their dining experience - their curved beak is large, curved and pointed downwards and is exceedingly strong and very efficient cracking the cones open for the kernels found within. They have been known to decimate an entire vegetable patch in a very short time too. Seeds form part of their diet and this is why farmers are not really fond of them in broadacre cereal farming, as they can power through a lot of seed and have hundreds in their flocks. Cockatoos make much loved pets - although anyone who has ever owned one of these majestic and quirky birds will know that Cockatoos are much more than just a pet. They are highly intelligent and are inquisitive and affectionate and have quite distinct, unique personality traits. They can be taught to talk and bond well with their owners. My uncle had one from his childhood and it passed away when he was in his late 70s, so not a pet to acquire too late in your life. My uncle's bird did have some rather colourful words which proved a bit embarrassing at times (depending on the company)! There is not much physical difference between male and female birds except for eye colour - females have a reddish coloured iris and males very dark or black. Cockatoos are usually found near adequate water and food resources in heavily treed areas. The pairs partner for life and build nests in tree hollows prepared by both the parents with wood chips. Babies stay with their parents all year. It is vitally important NOT TO FEED wild cockatoos. Luring in and feeding wild cockatoos on balconies, verandahs and outdoor areas can be a BIG mistake. With a growing population of cockatoos (because of the good food resources you are providing) and you miss feeding them (or when they demand it) they'll protest loudly whilst destroying any (or all) your wooden structures! 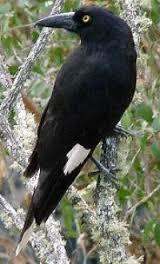 The Pied currawong is a large, 40-50cm, mostly black bird with a distinctive bright yellow eye. Small patches of white are confined to under the tail, the tips and bases of the tail feathers and a small patch towards the tip of each wing (only visible in flight). The bill is large and black and the legs are dark grey-black. Both sexes are similar, although the female may sometimes be greyer on the underparts. Young Pied Currawongs are duller and browner than the adults. People often confuse the Australian Magpie with Pied Currawongs but the two are quite different in plumage. The Magpie has a grey and black bill and a red-brown eye with large areas of white on the body. Pied Currawongs are found throughout eastern Australia, from northern Queensland to Victoria, but are absent from Tasmania. They prefer forests and woodlands, and have become well adapted to suburban areas mainly because of the abundance of food sources for them. Historically, Pied Currawongs used to breed in the Great Dividing Range and only visited east coast cities in flocks during the autumn and winter. However, they are now remaining in urban areas all year round and increasing numbers are nesting there too. Pied Currawongs have adapted to this environment and are now eating many small and young birds where cover for these birds is scarce, their eggs, exotic species of berries, lizards etc. Larger prey, up to the size of a young possum are also taken and birds will occasionally hunt as a group. Prey may be stored in a 'larder' (hung on a hook or in a tree fork or crevice) and either eaten straight away or, in the case of larger prey, over a period of time. Outside of breeding season large flocks of Pied Currawongs form, but at most other times these birds are seen alone, in pairs or in family groups. They have quite a distinctive flight habit - flap their wings twice and glide, flap twice and glide. They usually make their calls whilst in flight. The Pied Currawong's nest is a bowl of sticks, lined with grasses and other soft material. This material is gathered by both sexes, but the female builds the nest, which is placed in a high tree fork, up to 20m above the ground. The female incubates the eggs, and the male feeds her and continues to supply food to the female for the first week after the chicks hatch and she in turn feeds the chicks. To ensure the safety of our small birds like fairy wrens, finches etc we should plant species that will give these small birds shelter from the Pied Currawong. Also reduce quantities of exotic berry-producing plants, such as privets and Asparagus Fern is an essential component of any actions taken to bring Pied Currawong numbers down to a level where their impact on small birds is not so harmful. It has also been suggested that the Blueberry Ash (a native Australian tree) should not be planted in urban areas. In conclusion it would seem that these birds if left to their own habitats, without human influence, are just fine. We have to be sensible and NOT feed birds on a regular basis so they become dependant on us as a primary food source (it's OK to occasionally put some out). Always provide regular water for birds. Provide adequate protection for smaller birds - this can be achieved by planting species with dense, prickly foliage which will be more likely to attract and provide habitat for small birds. Grow these in a group to provide a dense thicket. If you wish to attract a range of species including some of the smaller honeyeaters then it is better to plant species that produce less nectar and which also provide cover for these smaller birds. A general rule of thumb would be to grow a cross section of plants which will provide a diverse range of habitats and food sources for birds. So I guess these two birds are both friend AND foe!